Kidzu is excited to unveil plans for our permanent home. Since our inception in 2006, our dream has always been to have a large scale facility fit for families with children of all ages with ample outdoor space – some of which would be free to the public year-round. Please endorse our plans to build the new Kidzu Children’s Museum in Southern Community Park. Sign the petition TODAY, and demonstrate to the Town of Chapel Hill the need for an inclusive family and community destination in the Southern gateway into Chapel Hill. Help us reach 1,000 signatures by June 10th! 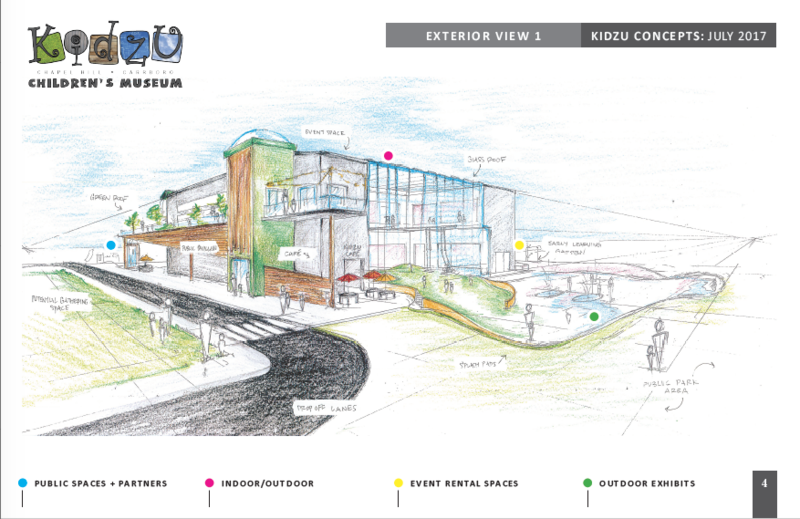 Kidzu’s goal is to build a right-sized museum reflective of the needs of our community – a museum providing robust and captivating indoor and outdoor learning environments for infants to teens and plenty of spaces for all kinds of community gatherings. Kidzu has petitioned the Town of Chapel Hill to enter into a public/ private partnership for a 3-acre piece of land in Southern Community Park. Please show your support and help us reach our goal.